Get ready to move and shake celebrating countries and cultures around the world! 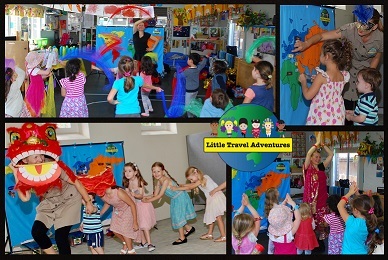 Little Travel Adventures are active, educational, and multicultural incursions for 2-5 year olds. Adventures can be booked as a one off visit, or regular visits throughout the year. • Runs for approximately 50-55 minutes. • Explores different cultures including the Aboriginal and Torres Strait Islander culture. • Uses music, dance, percussion instruments, props and an interactive world map. • Travels to childcare centres, daycares, preschools and playgroups within the Sydney area, complimenting the Early Years Learning Framework. Current Working with Children checked, and Public Liability Insurance. Contact Kristy on 0412 688 170 for more information.